You can access Cortana’s Notebook on your laptop to customize how Cortana deals with different topics. For example, you can make settings for Events, Finance, News, Getting Around, and more. 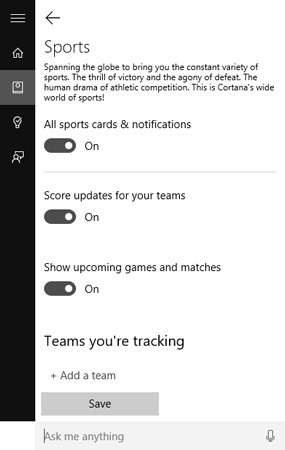 To explore any of these categories, click in Cortana’s search box to open Cortana’s panel, click the Notebook button, and then click a category, in this example, Sports. In the resulting Notebook panel if you want to add a team to track, click Add a Team under the Teams You’re Tracking heading, and then type a team name in the Search For a Team text box. Select a team from the search results and then click Add. By default, Score Updates for your Teams and Show Upcoming Games and Matches are set to On. If you want to change this click the switch to Off, and then click Save. You can control the pieces of information that appear in Cortana’s Home panel when you first open it by choosing to display Cards. To control what information is included, click the Notebook button, click a topic such as Sports or Eat & Drink, and then turn the Cards setting for that topic on or off.